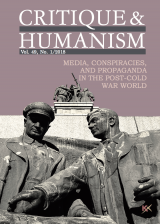 Kritica I humanizm is a Bulgarian magazine for the humanities. After the loss of confidence in the methods of modernism, the magazine searches for authors with an individual style, not only aestheticizing, but also confirming, a new position in the humanities. It aims to become an open field for intellectual and public debate, where debate is the means to form a position. The programme is directed towards building a new public sphere in Bulgaria, as well as integration into the international intellectual debate. A postmodern grid of the worldmap? Europe and its Shadow This text is a part of the research "The Bulgarian School and the Perception of Europe", undertaken by a team from the Institute for Critical Social Studies in cooperation with the Bulgarian Colleges Foundation and financed by the MATRA KAP Programme of the Royal Dutch Embassy. The research is part of the long-term research and educational programme of the ICSS in sociology of history. The sociological part of the project was implemented between March and July 1999 and included focus groups with high school history teachers and a questionnaire with students. The article presents the results from the group discussions with teachers (two in Sofia and two in Plovdiv).